A paper written by HSAC has been accepted into the Journal of Quantitative Analysis in Sports! This will be the second paper HSAC has published in JQAS. HSAC’s first appearance in the journal came in 2007, when the club looked at Park Factors in Major League Baseball. 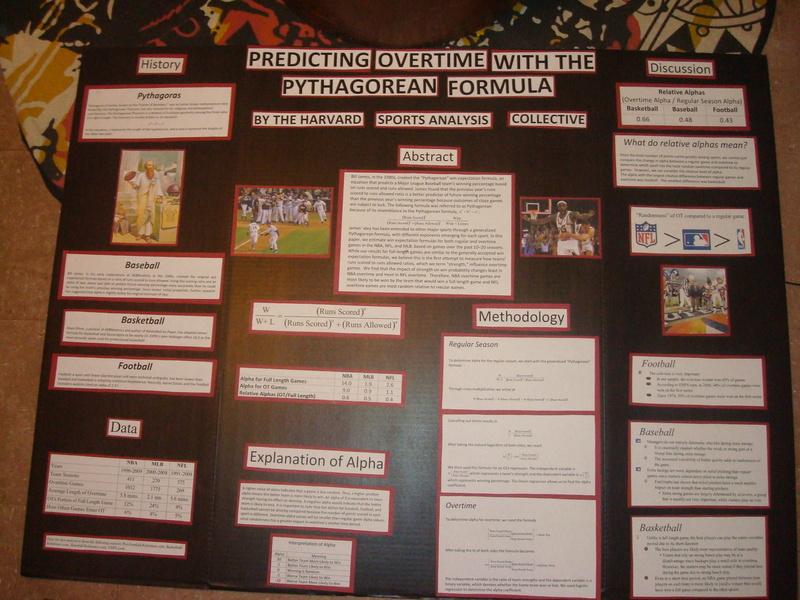 The recently accepted paper, “Predicting Overtime with the Pythagorean Formula,” uses Bill James’ Pythagorean formula to assess how team strength influences overtime in the MLB, NFL, and NBA. HSAC found that relative to regular games, overtime games are most random in the NFL and least random in the NBA. Last September, the same paper won the Best Student Project award at the New England Symposium on Statistics in Sports Conference. The abstract for the paper appears below. In 1980, Bill James created the Pythagorean win expectation formula with a somewhat counterintuitive idea in mind. James believed, and his formula proved, that a baseball team’s current runs scored to runs allowed ratio was better than a team’s current record at predicting a team’s future winning percentage. The rationale was that the outcomes of close games, which factor prominently in a record but not in a runs ratio, are subject to luck and randomness. The win expectation formula, listed below, was referred to as Pythagorean because the exponents of two made it resemble the Pythagorean theorem. James’ idea has been extended to other major sports through a generalized Pythagorean win expectation formula, with different exponents—which we call “alphas”—emerging for each sport. In this paper, we estimate the alphas for the win expectation formulas for both full-length and overtime games in the National Basketball Association (NBA), National Football League (NFL), and Major League Baseball (MLB), based on games over the past 10-20 seasons. While our results for full-length games are similar to the generally-accepted win expectation formulas, we believe this is the first attempt to measure how teams’ runs scored to runs allowed ratios—which we term “strength”—influence overtime games. We find through logistic regression that the overtime alphas for the NBA, NFL, and MLB are 9.22, 1.11, and .94, respectively. Comparing the full-length game win expectation formulas to the overtime formulas allows one to see how the impact of strength changes from full-length games to overtime games. It is discovered that the impact of strength on win probability decreases least in NBA overtime and most in NFL overtime. Therefore, NBA overtime games are most likely to be won by the team that would win a full-length game and NFL overtime games are most random relative to full-length games. If a team has a 75 percent chance of winning a full-length game, its chances of winning an overtime game are 67.28, 63.00, and 61.56 percent for the NBA, MLB, and NFL, respectively.